These cookies were inspired by a coffeehouse drink that is on their menu, it has dark and white chocolate swirled together with coffee. The cookies will be perfect alone or along with a cup of coffee. 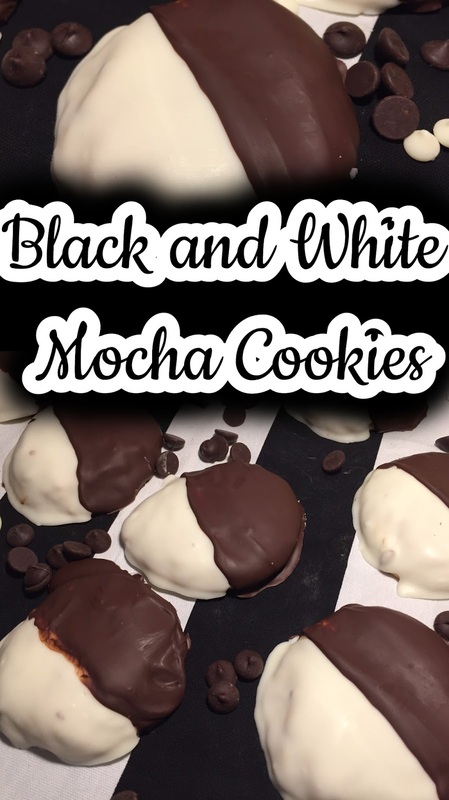 You may have seen these before being a famous cookie from New York where they are a black and white, one side chocolate icing and one side vanilla and on top of soft cookie. These are little different instead of the vanilla side it is a white chocolate but the other side is still chocolate. This is another recipe that my niece has helped me make. She even asked when was the next time I was going to make cookies before this. What kind of chocolate do you prefer? I like milk chocolate. Let me know in the comments. 1. Preheat oven to 350 degrees F, line two to three cookies sheets with parchment paper. 2. In a medium size bowl, combine flour, sea salt and baking powder. Set aside. In a separate bowl, cream together butter, granulated sugar and brown sugar until light fluffy. Add sour cream and vanilla extract until well blended. 3. Starting with 1/3 of the flour then one egg in three parts until all is combined. 4. Spoon out 2 tablespoons worth of cookie dough with two spoons then smooth out with the back of the spoon or wet finger. Bake in oven for 13 to 15 minutes until lightly golden brown. The cookies will be soft in the middle but set on the outside. Remove from oven and let cool on the cookie sheet for 10 minutes then transfer to a wired rack to cool completely. 5. Once the cookies are cooled, melt white chocolate with a tablespoon of coconut oil until smooth. I microwaved in 1 1/2 minutes in 30 second intervals. Spread white chocolate over one side of the cookies then place back onto parchment paper. Let white chocolate set for 15 to 20 minutes, depends on the temperature of your kitchen. 6. Melt semi-sweet chocolate chips with one tablespoon of coconut oil until smooth. Spread semi-sweet chocolate on the other side. Place back onto parchment paper to let set for 30 to 45 minutes, depends on the temperature of your kitchen. You can place them in the refrigerator and it will help set them. Store in a cool place. Note: For room temperature eggs and sour cream, place items out at least 30 minutes ahead of mix. Mmm, I could do with one of these right now! Chocolate and coffee are one of my favorite combinations - looks like a cookie I need to try. My kids love these cookies so I can't wait to surprise them with them! Looks so yummy! Think my daughter will absolutely love making these. Its all her favorite flavours! Looks yummy! Adding it to my list of recipes..thanks for sharing! These cookies look delicious!! I love how much chocolate there is here!! Wow so creatively made. Thanks for this detailed recipe. Holy bananas, these look divine! I love milk chocolate, but it's rare to find a chocolate I don't like. Oh my gosh, these turn out so pretty, what a delightful treat to serve to our friends. Thanks for another great recipe Luci! I'm not a cookie girl but this certainly looks like what I can have during a long day of work or first thing in the morning. Oh my stars! These look amazing! I love the sea salt thing with sweets, and I love the idea of the cookie having both kinds of chocolate! I will definitely try making these! Thank you for the recipe! OMG...these look so good!!! I am from New York so I love black and white cookies BUT I NEED to try these. Thank you!!! YUM!!! Those cookies look really yummy! I love dark chocolate personally and right now I'm on the Whole30 so I can only have 100% cocoa. They look delicious. The combination of dark and white chocolate is awesome. The cookies look so delicious, love the way you have presented them. I am going to try these out for a get together at my place this weekend. My Goodness, these black and white mocha cookies look so rich in goodness of Mocha. Tempting enough to give me a try. Oh my. These look wonderful. I'm a milk and white chocolate. No dark chocolate for me! My diet doesn't allow any of these but if not I wouldn't join. Oh my! Tjse look delicious! I love all types of chocolate but I prefer Dark chocolate. I love visiting your page because your recipes are amazing. They look delicious and very easy to make. Thanks for sharing this! I was just craving for something sweet and this one came on the right time. Quite an easy recipe to try. I prefer black chocolate but combining it with white made me crave for it lol I want to try this! It looks like the cakes are delicious. I love your recipe. I will check and can do them this weekend. These cookies looks really delightful and perfect treat for kids. I bet my kids will really love this so much. Oh my god! These look sooooo gooood, my mouth started watering.... they look so easy to make, I have to give them a try! I like milk chocolate as well. Your cookies look delicious, a perfect treat for a lazy afternoon with friends or family. They seem very easy to make as well! Those look awesome, very profressional looking! I don't eat a lot of chocolate but I'd love a dark chocolate version. I have no idea how you got the two different chocolates so neat and smooth on each side, the seperating line is perfect! Oh this is cookie perfection! Dark and white chocolate swirled together with coffee, how lovely does this sound!! Amazing :) I would like to try these asap, maybe I can ask my husband to try to make them. Thanks for the blog post that is sooo yummy! I'm a huge fan of white chocolate myself. I love the contrast in colours in these! Wow these cookies look amazing! I really love white chocolate and I prefer milk chocolate to dark chocolate. 'I'm a sucker for a good cookie recipe! I love the look of these and how they are completely chocolate covered too. These cookies look adorable...will definitely try making them this weekend and will share the pictures! These look and sound absolutely delightful!! We are such cookie monsters here at our house and they would disappear in a flash! Oh my goodness these look like pure perfection! I am going to have to try these cookies out as they look fairly easy to make. You have some of the best recipes, they make my sweet tooth come back all the time. Thank you for sharing. I can just imagine the taste of it right now. Makes me want to sink my teeth into something sweet. This looks soo delicious! I need to try making it with my mom! These look absolutely positively amazing! I’m a sweets junkie so I will be having to try these out very soon!